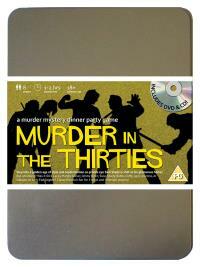 You've been invited to play the role of JIMMY OPEN in Murder in the Thirties. Who shot Sam Shady? Rooseville, 1931. Sam Shady, private eye to the stars, is celebrating his birthday in style. He’s invited all his current clients, as well as his closest rival, to dinner at his classy house. As his guests are getting to know each other before the first course arrives, Sam steps outside for a quiet smoke and shortly afterwards, he is found lying dead in the middle of his lawn. Find out who made Sam’s birthday go with a bang! Small-time crook (he’s handy with a crowbar!) Costume : A uniform striped grey t-shirt and blindfold with the eyes cut out belie your rich heritage. Heavy boots get you out of most scrapes and a ‘Swag’ bag swung over the shoulder is useful for all occasions. You moved to Rooseville last year, with the intention of settling down. You’ve since been trying to build up a reputation as a reliable, hard-working, jack-of-all-trades, but your progress has been thwarted by Bobby Cuffs, who seems convinced that you’re some kind of criminal. If it wasn’t for Sam Shady always coming to your rescue, you’d be behind bars by now!